This afternoon was the last World Cup game that would be played during the workday, so I went to the cafeteria to watch the France-Portugal match on the big screen. The TV appeared in the cafeteria three weeks ago at the start of the tournament and I watched several matches there, though I saw most of the games from my desk on ESPN360. 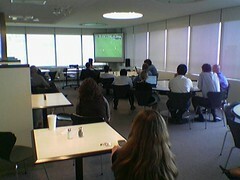 However, with the World Cup nearing its end, I thought I'd watch one last game with the die-hard fans in the office. I took this photo with my cell phone camera when the guy who handles the A/V setups asked me to document his handiwork. As you can see, there weren't too many fans there today, either because of vacations or lack of interest in the teams. Last week's Argentina-Germany quarterfinal drew a much larger crowd. Still, it was a fun way to spend a few mid-summer hours at work the day after a holiday. I asked if they could keep the TV there for the Tour de France, but I think it's going back into storage tonight.